Tag words:bacteriophage, phage, prophage, T phage, lysogeny, lysogenic conversion, lambda. Viruses that attack bacteria were observed by Twort and d'Herelle in 1915 and 1917. They observed that broth cultures of certain intestinal bacteria could be dissolved by addition of a bacteria-free filtrate obtained from sewage. The lysis of the bacterial cells was said to be brought about by a virus which meant a "filterable poison" ("virus" is Latin for "poison"). Probably every known bacterium is subject to infection by one or more viruses or "bacteriophages" as they are known ("phage" for short, from Gr. "phagein" meaning "to eat" or "to nibble"). Most research has been done on the phages that attack E. coli, especially the T-phages and phage lambda. Like most viruses, bacteriophages typically carry only the genetic information needed for replication of their nucleic acid and synthesis of their protein coats. When phages infect their host cell, the order of business is to replicate their nucleic acid and to produce the protective protein coat. But they cannot do this alone. They require precursors, energy generation and ribosomes supplied by their bacterial host cell. Bacterial cells can undergo one of two types of infections by viruses termed lytic infections andlysogenic (temperate) infections. In E. coli, lytic infections are caused by a group seven phages known as the T-phages, while lysogenic infections are caused by the phage lambda. The T-phages, T1 through T7, are referred to as lytic phages because they always bring about the lysis and death of their host cell, the bacterium E. coli. T-phages contain double-stranded DNA as their genetic material. In addition to their protein coat or capsid (also referred to as the "head"), T-phages also possess a tail and some related structures. 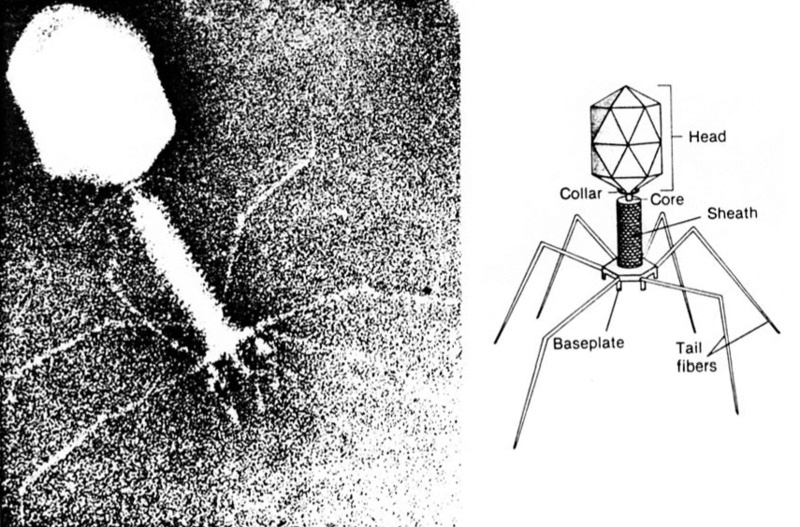 A diagram and electron micrograph of bacteriophage T4 is shown below. The tail includes a core, a tail sheath, base plate, tail pins, and tail fibers, all of which are composed of different proteins. The tail and related structures of bacteriophages are generally involved in attachment of the phage and securing the entry of the viral nucleic acid into the host cell. Left. Electron Micrograph of bacteriophage T4. Right. Model of phage T4. The phage possesses a genome of linear ds DNA contained within an icosahedral head. The tail consists of a hollow core through which the DNA is injected into the host cell. The tail fibers are involved with recognition of specific viral "receptors" on the bacterial cell surface. Before viral infection, the cell is involved in replication of its own DNA and transcription and translation of its own genetic information to carry out biosynthesis, growth and cell division. After infection, the viral DNA takes over the machinery of the host cell and uses it to produce the nucleic acids and proteins needed for production of new virus particles. Viral DNA replaces the host cell DNA as a template for both replication (to produce more viral DNA) and transcription (to produce viral mRNA). Viral mRNAs are then translated, using host cell ribosomes, tRNAs and amino acids, into viral proteins such as the coat or tail proteins. The process of DNA replication, synthesis of proteins, and viral assembly is a carefully coordinated and timed event. The overall process of lytic infection is diagrammed in the figure below. Discussion of the specific steps follows. The lytic cycle of a bacterial virus, e.g. bacteriophage T4. The first step in the replication of the phage in its host cell is called adsorption. The phage particle undergoes a chance collision at a chemically complementary site on the bacterial surface, then adheres to that site by means of its tail fibers. 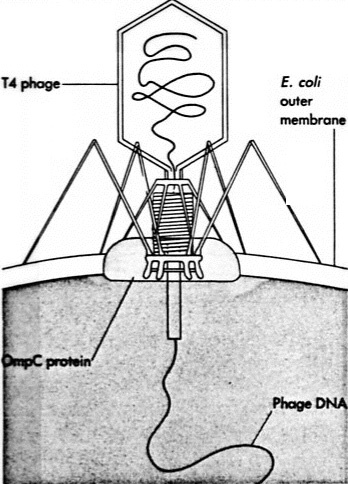 Following adsorption, the phage injects its DNA into the bacterial cell. The tail sheath contracts and the core is driven through the wall to the membrane. This process is called penetration and it may be both mechanical and enzymatic. Phage T4 packages a bit of lysozyme in the base of its tail from a previous infection and then uses the lysozyme to degrade a portion of the bacterial cell wall for insertion of the tail core. The DNA is injected into the periplasm of the bacterium, and generally it is not known how the DNA penetrates the membrane. The adsorption and penetration processes are illustrated below. Adsorption, penetration and injection of bacteriophage T4 DNA into an E. coli cell. T4 attaches to an outer membrane porin protein, ompC. 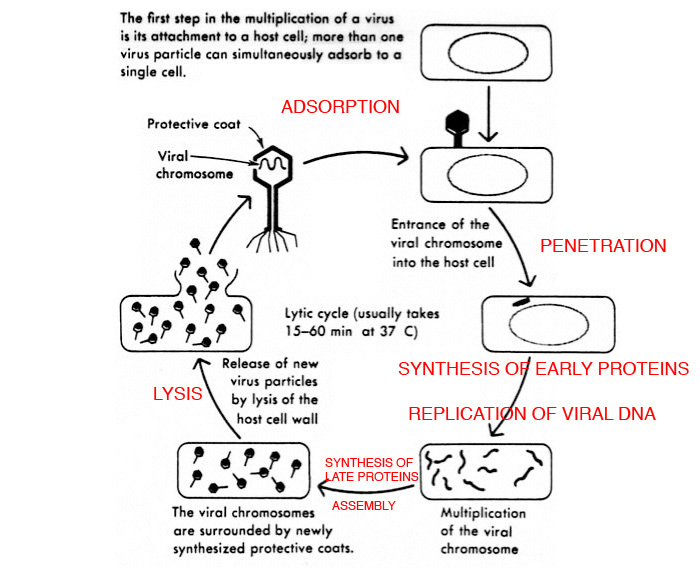 Immediately after injection of the viral DNA there is a process initiated called synthesis of early proteins. This refers to the transcription and translation of a section of the phage DNA to make a set of proteins that are needed to replicate the phage DNA. Among the early proteins produced are a repair enzyme to repair the hole in the bacterial cell wall, a DNAase enzyme that degrades the host DNA into precursors of phage DNA, and a virus specific DNA polymerase that will copy and replicate phage DNA. During this period the cell's energy-generating and protein-synthesizing abilities are maintained, but they have been subverted by the virus. The result is the synthesis of several copies of the phage DNA. The next step is the synthesis of late proteins. Each of the several replicated copies of the phage DNA can now be used for transcription and translation of a second set of proteins called the late proteins. The late proteins are mainly structural proteins that make up the capsomeres and the various components of the tail assembly. Lysozyme is also a late protein that will be packaged in the tail of the phage and be used to escape from the host cell during the last step of the replication process. Having replicated all of their parts, there follows an assembly process. The proteins that make up the capsomeres assemble themselves into the heads and "reel in" a copy of the phage DNA. The tail and accessory structures assemble and incorporate a bit of lysozyme in the tail plate. The viruses arrange their escape from the host cell during the assembly process. While the viruses are assembling, lysozyme is being produced as a late viral protein. Part of this lysozome is used to escape from the host cell by lysing the cell wall peptiodglycan from the inside. This accomplishes the lysis of the host cell and the release of the mature viruses, which spread to nearby cells, infect them, and complete the cycle. The life cycle of a T-phage takes about 25-35 minutes to complete. Because the host cells are ultimately killed by lysis, this type of viral infection is referred to as lytic infection.